Jonathan Harris, LEFT, and Ned Lamont. Harris is exiting a crowded race that now is likely to become a contest at the convention between Lamont and Susan Bysiewicz, the former secretary of the state. Bridgeport Mayor Joseph P. Ganim and former Veterans Affairs Commissioner Sean Connolly also will be competing with Lamont and Bysiewicz for the nomination at the convention. Guy L. Smith IV, a former business executive, says he will petition for a place in the August primary. “I like Jonathan and wish him well. But the withdrawal of Jonathan Harris from the governor’s race does not fundamentally change this race,” Ganim said. Harris is the second Democrat to exit the race in 11 days. After a long exploratory campaign, Hartford Mayor Luke Bronin decided not to go forward. U.S. Sen. Chris Murphy, a Democrat seeking re-election, is the de facto leader of the Connecticut Democratic Party this year, directing a coordinated campaign. He has not publicly endorsed a gubernatorial candidate, but his relationship with Bysiewicz has been fraught since crushing her in a primary for the Senate nomination in 2012. Bysiewicz repeatedly falsely claimed in that race that Murphy, then a congressman, was the top Democratic congressional recipient of Wall Street cash. “I’ve never seen a candidate intentionally and willfully lie over and over again after she’s been called to the carpet for it,” he said then. 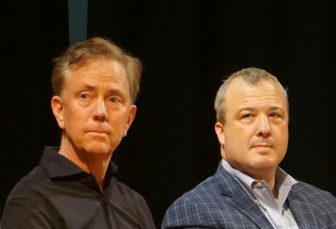 Ned Lamont, left, and Jonathan Harris at recent forum. 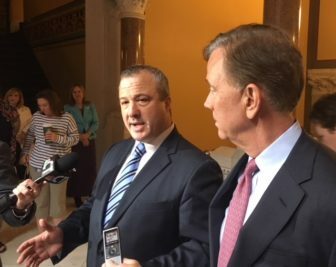 One of Murphy’s aides, state Rep. Sean Scanlon, D-Guilford, endorsed Lamont a week ago. Harris, 53, who was executive director of the Connecticut Democratic Party during Gov. Dannel P. Malloy’s re-election campaign in 2014 and then oversaw the Department of Consumer Protection for three years, declared his candidacy in February after a 10-month exploratory campaign. His fundraising has stalled, leaving him short of the $250,000 in qualifying contributions necessary for public financing, a mark he was hoping to reach before the convention on May 18. Harris is a former mayor and state senator from West Hartford. Lamont has opted out of the voluntary public-financing program, relying instead on his own wealth and some grass-roots contributions. He spent $20 million on a 2006 U.S. Senate race against Joseph I. Lieberman and $9.65 million on a gubernatorial primary in 2010, most of it his own money. Bysiewicz already has made his self-funding an issue, challenging him at a recent forum to live within the limits imposed on candidates participating in the public financing program: $1.5 million — a grant of $1.25 million and $250,000 in qualifying contributions. She and Connolly are seeking public financing. Ganim is barred from the program as a felon convicted of public corruption during his first stint as mayor. He was re-elected in 2015, five years after his release from prison. Lamont, 64, is the founder of a niche cable television company that serves college campuses. He has sold the company and has been teaching at Central Connecticut State University in recent years. Earlier this month, he won a straw poll at the Connecticut AFL-CIO convention, where he promised to protect collective bargaining for public employees and endorsed a $15 minimum wage.